Development of a European (Czech) HO small branch line terminus layout. How to make realistic loads for open wagons. A first venture into building an HO American switching layout described. A reprint of a September 1982 article in SMT and much requested photo-copy dealing with conversions of the Mainline J72 (and now by Bachmann) into an SR G6 or a J73. 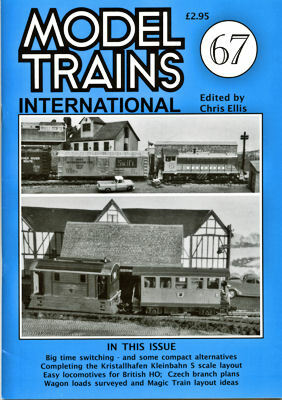 The potential of Magic Train investigated in an Oe layout. How the Oe track plan for Ericbridge 67/352 was evolved, and with other examples. Fact is turned into fiction for this suggested inner-city OO layout. Plans for a very large American HO switching layout with plans of suggested smaller segments .